How do you assess LV diastolic function in the presence of Atrial fibrillation ? Doppler Mitral Inflow velocity profile is the key to assess LV diastolic function . The ratio between E and A has become most popular parameter . In the absence of atrial contraction what shall we do ? The answer is simple . We have 2 D parameters of LV diastolic function. LA dimension ( > 30 % basal dimension which is usually > 4 cm ) is a most specific marker of diastolic dysfunction in the absence of mitral regurgitation or stenosis. The only available velocity E wave profile can help .A short E deceleration time in a short cycle would suggest significant diastolic dysfunction.High amplitude E wave > 2 M/sec in the absence of MR will suggest diastolic dysfunction . Curiously , it can be assumed an episode of lone AF per-se , be an indicator of diastolic stress for the left atrium . Mitral annular velocities / E propagation velocity / E/E’ are other tissue Doppler parameters can be used. All in one ICD lead system . . . Does the electrophysiologists seek comfort at the cost of patient safety !! ICDs have revolutionizes the management of refractory VT and in the prevention of sudden cardiac deaths in vulnerable population.Every year 100s of thousand ICDs are implanted . Three industry leaders are providing state of art machines. The technology is evolving . 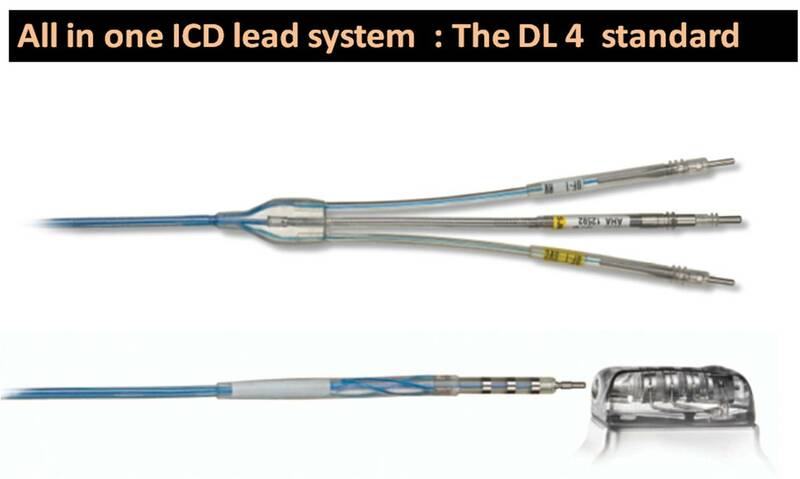 Till recently , the shocking leads of ICD has a separate connectors called DF1 . Now, we have all 4 leads incorporated into one lead connector called DF 4 . It has gained tremendous interest among cardiologist and stand alone electro-physiologists . The reason is simple – Ease of implantation ! Does the ease of implanting do compromise the efficiency of ICD system ? I am surprised by this article . Here is an excellent analysis by a truth seeking electro-physiologist about the genuine issues of ICD implantation especially to potential problems with DF 4 interface . Why is ventricular septal rupture often a painless event ? Ventricular septal rupture is a major mechanical complication of STEMI . Excruciating chest pain , is the sine qua non of any myocardial tear , dissection and rupture . 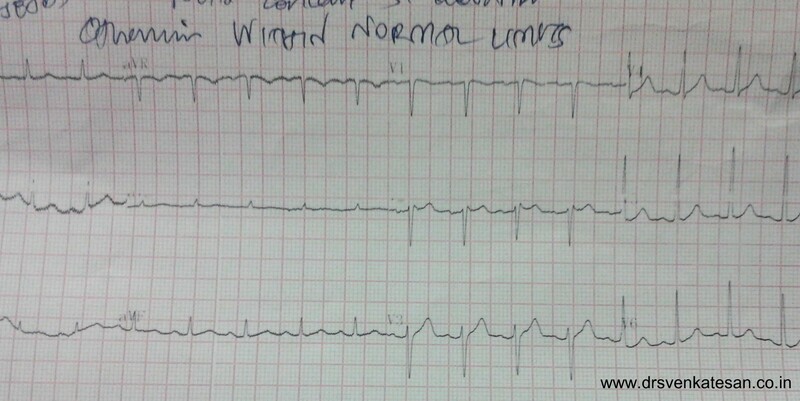 It is surprising , VSR following STEMI is rarely a painful event . I can recall number of such events , when a stable patient with persistent ST elevation in the coronary care unit , wakes up next morning with a systolic murmur.And echo reveals a septal defect promptly. Three reasons can be proposed for relatively pain free rupture of IVS in STEMI. Typically VSR occurs in 3rd or 4 th day of infarct . By this time myocardium can be as soft as an ice cream ! . There is not much stress and strain at the site. The necrotic debri just gives way to spikes of LV systolic pressure . For rupture to occur there must be transmural infarct .The pain nerve terminals also die in the process . Further , it is a cavity to cavity rupture (LV to RV ) . Direct pericardial stretch does not occur . * Ventricular free wall tear is a near fatal event is extremely painful .This often occurs in the first 24 hours when the nerve terminals are alive . The free wall rupture is more of a tear in the plane of myocardium . The pericardial (epicardium) layer has rich somatic nerve supply . Early myocardial tear involving the epicardial surface can be severely painful . Late giving way of softened , necrotic often hemorrhagic muscle ( especially in the IVS ) is less painful or totally painless. By the . . . what happens to pieces of septal myocardium as it gives way and enter the right ventricle ? Simple way to record central Aortic pulse in the Echo Lab ! A pulse wave is generated with each heart beat when the potential energy is converted into kinetic energy. For the pulse wave to travel from the heart to periphery Aortic integrity is vital. 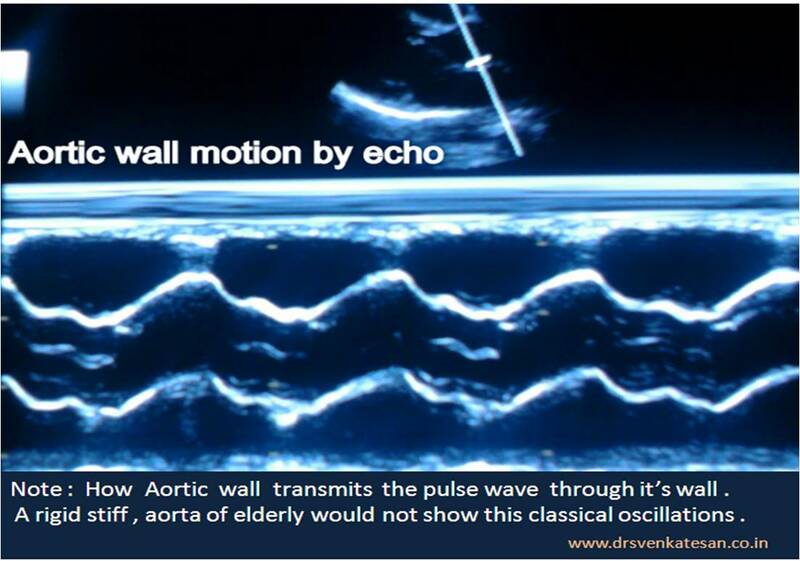 The pulse wave travels through the walls of arterial tree , in the process the wall itself is set into oscillations . Whether the moving blood imparts the pulse on the walls or the walls itself vibrate independently is not clear . The following M -Mode echocardiogram of aorta from young man stunningly documents the morphology of central aortic pulse wave . 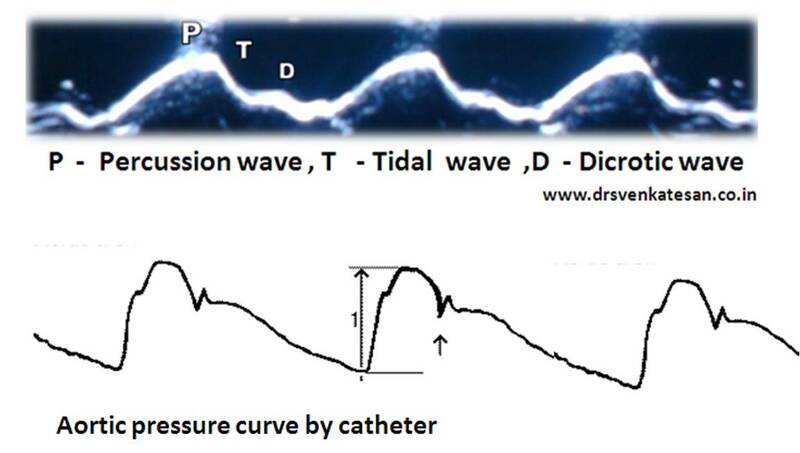 Note how closely it resembles the Intra- aortic pressure curve recorded with a catheter. Further studies are warranted regarding the rate of raise (Slope) of aortic wall motion , and the quantum of motion ,its correlation with central aortic pressure etc. This would unravel the the mechanisms of Isolated systolic hypertension , where a stiff aorta amplifies the systolic pressure due to loss of elasticity .